A crowdfunding platform and an agriculture-focused non-profit offer their advice on how to navigate the crowdfunding process successfully, and what they would do differently. Agribusinesses across ACP countries are turning to crowdfunding as a way of raising funds in a sector that struggles to attract formal bank finance. In recent years, Africa has seen the launch of a flurry of platforms aiming to tap debt or equity finance for farming projects, while agriculture-focused non-profits and individual farmers are turning to general purpose crowdfunding sites to raise donations – to help pay for everything from inputs, to farming equipment and training. Some of the best known names are Farmcrowdy and Growsel, while Kickstarter, BlueBees and Lelapafund have also been used to raise funds for agriculture projects. However, there remain many challenges for crowdfunding on the continent. A lack of regulation hinders efforts to scale up, while individual crowdfunders must dedicate significant time and effort to market their cause amid growing competition. Nevertheless, two ventures shared their experiences with Spore, including lessons learned and advice for other agribusinesses looking to seek crowdfunding support. Since its launch in 2017, Nigerian agri-tech company Thrive Agric has rapidly expanded, facilitating more than €2.6 million of finance for around 10,000 farmers involved in more than 10 projects across the country. By the end of 2019, it aims to expand this to €8.8–13.2 million for around 40,000 farmers, according to Uka Eje, head of strategy and operations. In return for a cash injection of around €190 on average, the investors – mostly Nigerian – become shareholders in the project they fund in return for 40% of its post-harvest profit. 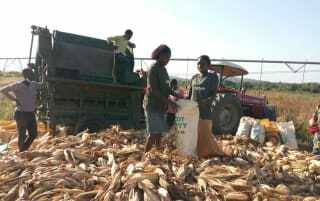 Farmers also receive 40% and Thrive Agric takes the remaining 20%. For every project listed on the site, Thrive Agric first conducts a full cost analysis and develops schedules for farm activities, from land preparation to harvesting, and agrees a price for the final produce with buyers like Unilever or Nestle. This allows the company to calculate upfront the return investors can expect and in what time frame. For example, previous Thrive Agric fundraising saw investors in a tomato farm receive a 15% return on an initial outlay of €186 after 7 months, and investors in a cattle-fattening project earn 20% on €431 after 6 months. However, building trust among investors is still a challenge for crowdfunders, particularly in developing countries where the model is less established, Eje notes. Word of mouth, whereby satisfied investors share their good experiences with friends and family, is the best way of achieving this, but it takes time, he says. Eje advises entrepreneurs looking to launch a crowdfunding platform try to link up with bigger organisations, such as the International Fund for Agricultural Development, for a ‘stamp of approval’ to help them scale up fast. Although crowdfunding remains one of the few ways individuals can invest in agriculture in ACP countries, the sector’s perceived high risk raises the trust barrier further. To counter this, each Thrive Agric project is protected with insurance – with details provided on the project listing – so that if a crop fails due to severe weather or pests, investors are guaranteed to receive back their initial investment. Thrive Agric also works closely with the cooperatives behind its projects to offer training in good agricultural practices, and to provide investors with regular updates on farm activities. Crowdfunding is, of course, only part of the solution in terms of expanding farmers’ access to finance and Eje recommends platforms provide a launch pad for them to tap other forms of investment. Thrive Agric, for example, is building a farmer profile or ‘data room’ for each farmer it funds that Eje hopes banks and other lenders will accept in the future as a proxy for a credit history. African Women in Agriculture (AWiA) – a Johannesburg-based organisation planning to open four women-run rooftop hydroponic farms in the city’s Sandton district in its first 2 years – raised €3,675 through its debut crowdfunding in November 2018, 6 months after the non-profit’s launch. The sum fell short of AWiA’s ultimate target, but has been sufficient to plant more crops at an existing plot of land at a children’s home in Soweto. AWiA’s Chairperson, Jenni Scheckter, says the children’s home investment will be an important part of AWiA’s story in future crowdfunding opportunities as they seek to raise the money needed to construct the hydroponic farms. AWiA generated the money on South Africa’s Thundafund which, since its 2013 launch, has raised €1.6 million for 465 projects from a range of sectors. It operates an ‘all or nothing’ model under which projects must set a ‘dream goal’ for their fundraising, as well as a lower ‘tipping point’ that they must reach within 30, 45 or 60 days, otherwise funds are returned to donors. The platform charges a 5% commission rate for NGO fundraisers and 7% for other organisations and individuals. Scheckter regrets not following Thundafund’s advice to be less ambitious with AWiA’s tipping point than the €3,174 it set. Hitting the tipping point quickly and then possibly raising the bar once or twice again would have enabled AWiA to use the milestones in its fundraising story. AWiA secured one television and two radio interviews without any PR budget, but this took an “enormous amount of effort” and Scheckter wishes she had started earlier. Leverage all your personal and professional networks and target potential social media ‘champions’, who might share updates about your fundraising to their own networks via WhatsApp or Twitter to build momentum, Scheckter states. Half of the sum raised by AWiA came from just two donors, so identifying a few deep-pocketed potential donors with a connection with your cause can help. Offer a reward that donors want (AWiA gave out packs of heritage seeds from a Soweto seed bank) and do not assume everyone is as passionate about your cause as you are, Scheckter advises. The development of rules to govern crowdfunding – which currently exists in a regulatory vacuum in many African countries – would be a big step forward in improving credibility, argues Eje. The African Crowdfunding Association is pushing for this and, in October 2018, won a €260,000 grant from the UK Government to help it develop investor protection rules. An accreditation system was also set up using this loan and is expected to help encourage investors outside the continent to participate. There are four main crowdfunding models. Donation-based crowdfunding sees individuals simply give money to projects or causes they support. The rewards model is similar, although donors are rewarded with a gift whose value can vary depending on the size of their donation and is typically related to the project. With equity crowdfunding, investors receive equity or a share of the project or company they contribute funds towards, and so receive a portion of any future profits. With debt-based crowdfunding, investors lend the project a sum of money that they receive back at a future date plus an agreed upon percentage of the initial investment as an interest payment. Business and financial journalist for publications including Devex, Shares Magazine, TXF News, Trade Finance Magazine, Global Trade Review, Newsbase and Global Mining Finance. Editing, copywriting and SEO for companies ranging from Misys, Lloyds and tradimo to Rough Guides and STA Travel. Distributed ledger technology promises to help plug a trust gap in agricultural commodities trade and finance, with new platforms offering farmers a bigger pool of buyers for their harvests. Improving rural women’s access to finance represents an untapped business opportunity for financial service providers prepared to tailor products to meet their needs and to find innovative ways to overcome social and logistical hurdles. Loan guarantee funds can be a powerful tool in helping smallholders access finance, but getting the model right is vital. The planned launch of grain futures contracts in Zambia will help farmers and other stakeholders to protect themselves from volatile prices and could encourage other countries to follow suit.